We can’t include any counties on the Ohio River. They aren’t isolated enough. This excludes Boyd, Greenup, Lewis, etc. I-64 runs through Montgomery, Bath, Rowan and Carter Counties. Again, they are excluded because of lack of isolation. Elliott County is an exception because–well–you just have to visit there to see. Once you push too far north, you get out of the mountains, and we have to exclude you. Goodbye Fleming, Nicholas and Robertson Counties. Robertson County is the toughest to exclude. It definitely has an Eastern Kentucky feel to it, but it’s out. Mountains. You have to have mountains, not hills. Fleming County has beautiful, rolling hills, but they aren’t mountains. Isolation. It has to be kind of tough to get there or at the very least it’s just on the way to somewhere else. Rarely is an Eastern Kentucky county a destination. On this criterion, Robertson County would qualify, but again, it’s just too far north. Coal Mining. You need some coal mines, either now or in the past. We’re from coal mining stock. Accents. You have to sound like us. 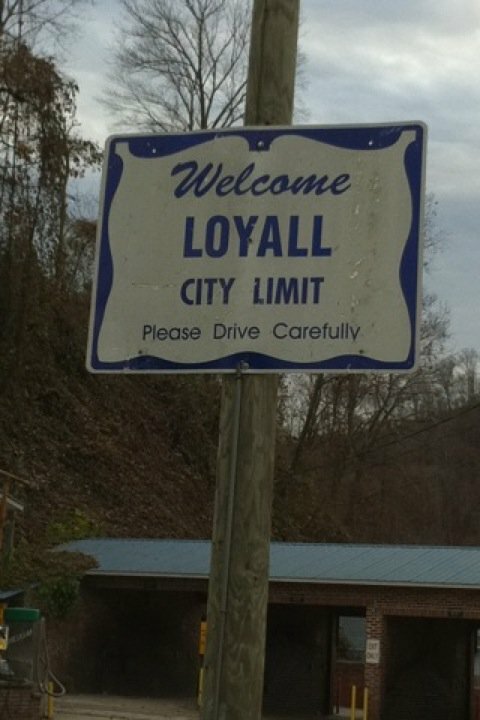 Now, people in Carter County pretty much sound like us, but they have that Interstate. I hail from Harlan County, the Eastern Kentuckiest of all counties. We’re isolated. Very isolated. Harlan County is not on the way to anywhere. If you need to go someplace that can be accessed through Harlan County, I guarantee that there’s an easier, quicker way to get there. Harlan–that’s what we call it–isn’t a destination, either. There aren’t any hotels to speak of, really. No Holiday Inn Express, Hampton Inn, etc. There are a couple of places to stay, and they’re okay. If you’re spending the night in Harlan, you probably have family there anyway. We have mountains all around us. We’re hemmed in. We mine coal and have for over 100 years. We also have accents, heavy mountain accents–the kind that can be indecipherable even to natives of the area. I don’t live in Harlan now, but I’m still a Harlan Countian. Always. So, I speak of how it was 30 years ago. One of the great things about Harlan is that changes very little. It’s still pretty much the same. 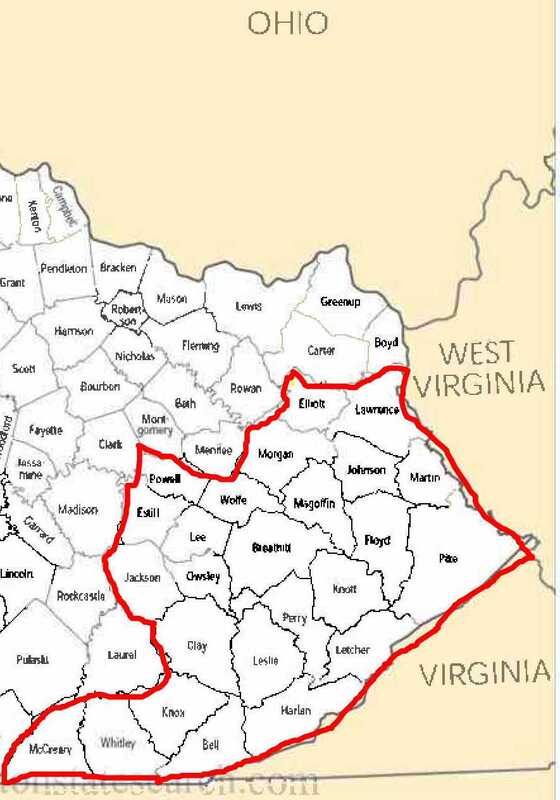 Now, don’t confuse Harlan County with the town of Harlan, our county seat. If someone tells you that he or she is from Harlan, they could mean any town from Pathfork to Holmes Mill to Cumberland to Cranks. Only if we’re talking to another Harlan Countian would we narrow the description to the town. Myself, I’m from Loyall which is three miles from the town of Harlan. I’ll say I’m from Harlan, but don’t get confused. I’m from Loyall. Unless you lived in the town of Harlan, you don’t go to the “city” schools–Harlan High Elementary and Harlan High School. I attended Loyall Elementary and Junior High and James A. Cawood High School. Cawood was named after James A. Cawood, long time Superintendent of the Harlan County Schools. None of my schools still exist. Now kids go to Harlan County High School which consumed Cawood, Evarts and Cumberland High Schools. We used to be territorial based on our schools. When we went to high school, we identified as being from Loyall or Hall or Wallins. We rarely hung out with anyone from Evarts or Cumberland–in those days, they had their own high schools. They might as well have been in different states. The vast majority of Harlan Countians are proud to be from Harlan. We are our own world. We like that it’s called Bloody Harlan by some folks even though that name is based upon events which occurred 70 years ago. 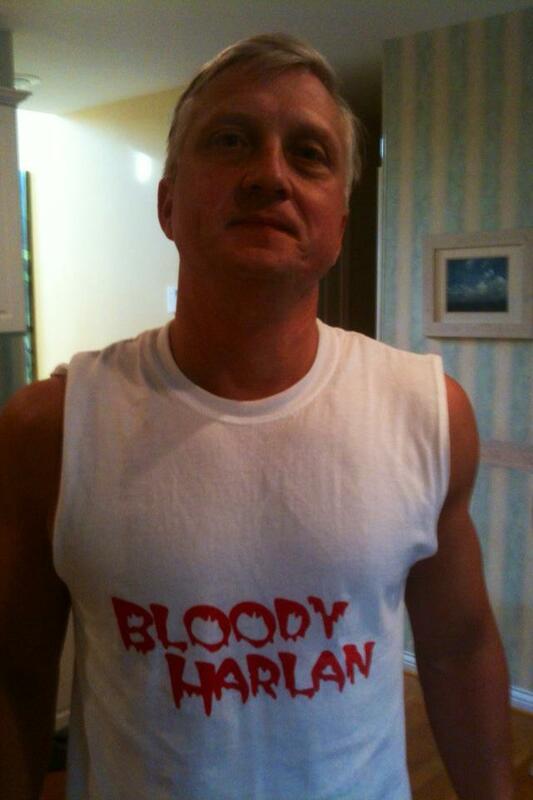 Bloody Harlan is just badass. We like being the badasses of Eastern Kentucky. Your author proudly claims his heritage. Many people watch the FX series Justified. Justified portrays Harlan as a lawless frontier of wanton violence. Harlan Countians like Justified. We like people to think we’d kill them for some trivial reason. Before Justified, many people got their image of Harlan from the award-winning documentary Harlan County USA which followed the Eastover coal mine strike at Brookside, Kentucky. Harlan County USA divides us into two groups: Those that love it and those that hate it. The ones who love it love the depiction of rough and ready union brothers and sisters ready to wage war with the coal company thugs. The rest of us (that includes me) hate the image of Harlan Countians as violent, uneducated hooligans. They point to the many fine folks in the county who were (and still are) horrified by the goings on at Eastover. The truth, of course, probably lies somewhere in the middle. The folks in Brookside were surely Harlan Countians as was the chief gun “thug,” Basil Collins. Basil was a neighbor of ours when I was a kid, so I know he was real. My mother drove through Brookside to go to work every day, so I also know the strike was real. Harlan has always been divided into pro- and anti-union. It still is in some ways, although it has been many years since the United Mine Workers Association held great sway. That bastion of journalism, Hustler Magazine, once listed Harlan (the town) as one the three meanest towns in America. It was described as a place where people only smiled when they heard that someone had died. Harlan Countians did not like that. Not at all. I suspect it’s mostly because they didn’t care much for Hustler, at least not publicly. Overall, we like the stereotypical portrayal of Harlan. Harlan is tough. Harlan is mean. Harlan is total badass. Growing up, I didn’t feel particularly tough. Then, I moved to Lexington, Kentucky and found out that I was pretty tough by Lexington standards. For instance, threats didn’t faze me. I knew that truly dangerous people don’t threaten much. They just inflict harm. Of course, there’s a downside. A mouthy little man like me finds out the hard way that bad is good, but big is better. Bad and small isn’t a recipe for success. We mispronounce light, fight, white and night. We all know someone named Lonzo. We have accents which are obscured by our penchant for mumbling. We know at least one person who has been shot with a gun by someone else or by themselves accidentally. We are related to at least one coal miner. We say Papaw and Mamaw. We know trash when we see it, and I’m not talking about garbage pick up. We know at least one person whose mother was really their grandmother, and sister was their mother. Trust me on this one. Harlan Countians can be found everywhere. Who are we? These are the folks who stayed in Harlan. They are either Harlan by birth or moved there at a young age. They might have gone to college or joined the military. Regardless, they came back. Maybe they never left. These are small town people just like in every small town. Small town life can be hard or easy. If it’s hard, it’s hopeless. If it’s easy, there’s nothing better. In that regard, Harlan is Small Town, USA. There are doctors, lawyers, accountants, teachers, coaches, laborers, deadbeats and criminals. There are good people and bad people. Like anywhere else, you have to hope to you don’t cross paths with the bad ones at the wrong time. Among this crowd are those that my father called “off the grid.” He said we had a sub-culture of people “so far off the creek” that they weren’t plugged in to the modern world. That is certainly true, but I must say that those unfortunates (if that’s what they are) are the in minority.. They may be from such places as Shields, Jones Creek, Smith, Cranks, Punkin Center or Happy Top, although I can name you folks from all those places who have done quite well for themselves. Harlan is no more defined by any subculture than Chicago should be defined by its sad history of public housing or New York by the worst of its slums. Yes, we have folks living in poverty–too many (as though there is an acceptable level of suffering) but most folks live just fine. My parents were stalwarts. My Dad was born in Evarts and–expect for military service and college–never lived anywhere else. My mother moved to Harlan County from Pike County at around age 12 and never left except to attend college. They had no desire to ever live anywhere else. And they didn’t. I am an outlander. An outlander is someone who used to live in Harlan. We’re still Harlan Countians. We just live somewhere else. There are a lot of us spread over the country, but we still think of ourselves as being from Harlan. I haven’t lived in Harlan in 30 year, but if someone asks where I’m from, “Harlan” is the immediate response. Some are like me. I went to college and had personal and professional opportunities that pulled me away. Others leave to find better opportunities. There are people who will pretend to be from Harlan or any place else in Eastern Kentucky. That’s right–they’ll pretend. They have cousins or in-laws or remote ancestors who hailed from the mountains. This, so they say, makes them mountain people. Of course, it doesn’t. We laugh at them but let them have their fun. They’re usually the folks who dream of turning all of Eastern Kentucky into a massive tourist destination by having all the people who live there pack up and move. Then, they can come back and pay admission to see where they used to live. Sometimes, these people would show up to help us. We were always suspicious of outsiders, especially those offering “help.” We could tell if you were from Ohio or Michigan or some other exotic place. You talked funny. You weren’t one of us. Go help someone else. These folks are Harlan Countians, but they don’t like it. They might even live in Harlan, but it doesn’t suit them. It’s too dull. It’s boring. There’s nothing to do. There’s no future. It’s bleak. But they don’t always leave. They just hang around and complain. Most of us pass through this phase at some point. Many never leave it. Some of these folks do leave Harlan–a lot of them, in fact. They go to other parts of the state or country and live as ex-Harlan Countians. They don’t like being from Harlan. They don’t want to sound like Harlan or look like Harlan. They pity Harlan. They know what’s best for Harlan, though, and won’t hesitate to tell you. Even though they know what’s best for Harlan, we don’t really like them. My children are fascinated and perhaps slightly horrified that I grew up in Harlan. Even though they have visited my homeland many times, they remain baffled by it. Even though I haven’t lived there in many years, I still visit. I’m fortunate that my job regularly takes me to Eastern Kentucky. Harlan is quiet, unless you grew up near the railroad tracks like I did. Then it was quiet except when the trains ran, which seemed like every 15 minutes or so. Loyall had a school, a railroad yard, one stop light, a movie theater (at one time), the Corner Store (a genuine soda shop), a gas station, a barber and a couple of stores. A convenient store replaced the gas station and stores. The school closed. All that’s left is the yard and that light. We had our own post office, City Hall and fire station. They’re still there. About 1,000 people lived there when I was a kid. Maybe 700 or so now. It was quiet then. It’s quiet now. We once had a train full of nerve gas pass through Loyall. People gathered at the railroad tracks to watch it. Why? I don’t know. Maybe they were hoping to see (or experience) some kind of catastrophe. Maybe they just didn’t have much else to do. Sometimes you hear gun fire in the distance, but that’s in the woods. There aren’t running gun battles anymore like the famed Battle of Evarts many decades ago. Oh, people still get shot occasionally but at much lower rate than we’d like you to believe. The county is big, about 50 miles across, but sparsely populated. Like much of Eastern Kentucky, the population has declined for decades. One can argue that it’s always been over-populated what with the chronic high unemployment and high poverty rate. The “first of the month” is a big time in Harlan. That’s when people get their checks. Government checks. Disability checks. Welfare checks. Food stamps, too. Town is flooded with people. When I was young, the Government Cheese truck looked like a scene from an African relief mission. People were practically hanging on it. Although we certainly weren’t poor, Government Cheese is excellent, and my Dad would get us a block whenever he could. I miss Government Cheese. We only periodically had a movie theater, the fabulous Margie Grand in Harlan. It would occasionally be condemned but re-open at some point. It was an old theater whose best days had long past. Plaster would fall from the ceiling and you could throw popcorn on the stage in front of the screen and watch the rats scurry out to eat. It was tough to find two functioning seats together. It reeked of Pine Sol. It was a movie experience like no other. Sometimes, the film would jam and you could watch it melt. It even had an old balcony where–rumor had it–black folks used to be seated. Loyall also had a theater–the Roaden–until I was about 6 years old. For many years now, Harlan has had a multi-screen cinema. Sweet. Mostly, we didn’t do much, because there wasn’t much to do. Oh, you might go to Gary’s Lounge and Roller Rink sometimes. Gary’s was a fun place. One side was a roller rink. The other side was the Lounge, a long, narrow open room with a dance floor. A friend of mine once drank a beer from a girl’s cowboy boot at the Lounge. You don’t see that every day. Mostly, we just hung out. Funny thing is, that’s what my kids do, even though they live in a small city with a million things to do. I guess teenagers everywhere just hang out. Oh, and we moaned and complained about not having anything to do. My kids do that, too. When I went to college, I befriended other Eastern Kentuckians. One guy said we were like Indians who left the reservation. Even though I had been lots of places, leaving Harlan took me out of my comfort zone. Honestly, it took me years to adapt. I went from a county of about 35,000 people spread over 1,000 square miles to a campus of 20,000 + crammed into a few blocks. No wonder I was overwhelmed. Since I’ve been gone, Harlan–like all of Eastern Kentucky–has been devastated by prescription drug abuse. We didn’t have that problem when I lived there. If we had a problem like that today in my slice of Suburbia, there would be a full-blown panic. Now, sadly, it’s a way of life in the mountains. Coal mining runs in cycles. Right now, it’s in a big down turn. That hurts everyone. There is a bleak side to Harlan, as anywhere else. Like inner cities, there are generations locked into a poverty cycle. Some escape, but most don’t. There has always been tension between those who work and those who don’t or won’t. Nothing will get a hard-working coal miner or school teacher fired up like a discussion about those “drawing a check.” That’s how it was when I was a kid, and it hasn’t changed. We also suffer from stereotyping. Our teeth aren’t all that bad, although mine aren’t great. We didn’t all drink Mountain Dew as babies. I’ve never known anyone who didn’t wear shoes–and I knew some pretty rough characters. I knew no one married to his own sister and just a handful married to their cousins. We’re also the last of a breed–and this applies to all of Appalachia. We’re the last group that can openly derided. We can be called ignorant, inbred, genetically inferior, toothless, shoeless–you name it. If you do so, you won’t be called a bigot or a phobe of any type. You might even become a best-selling author or reality TV producer. My life is very much divided into two parts–before and after Harlan. Now, far in the past, at least until I visit. Give me about 30 minutes, and it’s like I never left. That’s pretty cool. If you live in Harlan, I can’t say that I blame you. If you don’t, I can’t fault you for that, either. It’s a nice place. Different, but nice. If you don’t believe me, I just might have to kill you. “Why do men fight?” In his old age, my Dad would often ask that somewhat rhetorical question. I knew not to answer. He would answer it, explaining that men fight because they’re trained to fight–no other reason. I always saw the military through my Dad’s prism. He was a veteran of two branches of the military and two wars. He was as proud as one could be of his service. I was born in 1962, perfect timing to avoid military service. The draft was suspended before I was 18, and there were no wars while I was a young man. Besides, Dad told me that I wasn’t military material anyway. He was right. Almost everything Dad told me about his service was in the last 5 years of his life. Prior to then, I’d heard a few stories, like the time he debriefed a couple of pilots who spotted UFOs over China. He also told a few stories about the time he spent in the hospital in WWII. Otherwise, like a lot of men of his generation, he didn’t talk all that much about it. In January of 2003, Dad had a stroke while at a meeting. He passed out, but came to almost immediately. Because he seemed disoriented, a friend of his called me and said “Earl had some kind of spell. You better check on him.” I called Dad, and he seemed fine but very tired. I made him promise to see the doctor in the morning. I talked to Mom, too, and she said he seemed okay. My mother was given to hyperbole, and I assumed this was more of the same. She had fallen about a week before Dad’s “spell” and was still pretty sore. I was talking to them both daily, and he seemed fine to me. Nevertheless, I headed down there. When I got there, Mom was on the couch and Dad was in his usual spot in the kitchen. I sat down with him and asked if he was okay. He said: “Did I ever tell about Korea?” He then drew a map of Korea and told me about it. In detail. He drew the map from memory, and it was remarkably accurate. After about an hour and half of listening, I told Mom: “Okay. You’re right. Something is wrong.” After a few doctor’s visits, we found out he had a significant stroke. As with a lot of my Dad’s ailments, he was an unusual patient. His doctor at the University of Kentucky told me that out of the thousands of stroke patients they see each year, they get 3 or 4 like him–those who suffer severe strokes without physical damage. The good news was that the doctor told me he would have these spells of “delirium” where he would talk and talk, but that it would get better. It did. In the meantime, I learned a lot I had never known. Oh, and my mother was right. It was a crisis. Her fall led to a series of issues for her, and she was dead by May. Dad was alone now, and we had much more time to talk than ever before. He wore me out. As with a lot of things, what at first was maddening turned out to be a blessing. For the next five years, I got to know him in a way that I never had up until then. 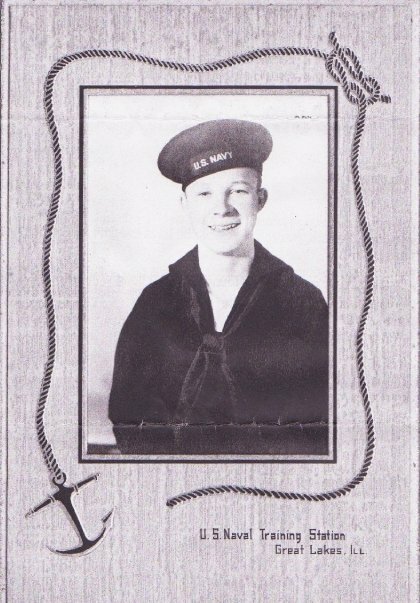 Dad joined the Navy in late 1942. He turned 18 on January 19, 1943. He didn’t finish his senior year at Evarts High School, but he graduated anyway. They would do that for you in those days. My Granny accepted his diploma. He was 5′ 5″ and weighed 115 pounds. 1943. Dad at the Great Lakes Naval Station. 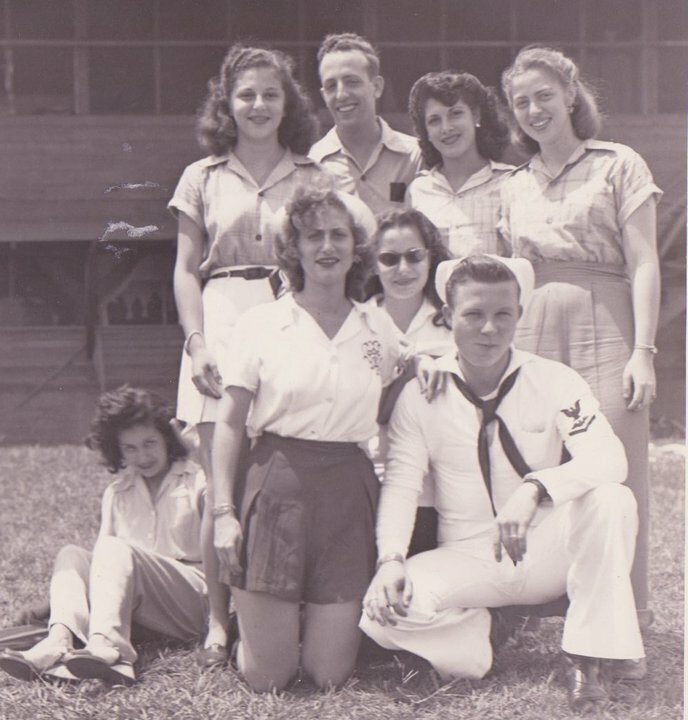 Dad living it up with some nurses in the Navy. The Navy ended up training Dad to be an airship rigger. That’s right, airships–blimps. Dad noted many times that he couldn’t have been trained in a more useless vocation, although Goodyear did offer him a job. By 1946, Dad was out of the Navy. With the future of airships not looking promising, he had to do something with his life. Dad never hesitated to credit the GI Bill for his success in life. All he’d ever aspired to was a “good job outside.” By that, he meant at the coal mines but outside, not underground. Instead, he got to go to college. He went to the University of Kentucky and immediately signed up for Air Force ROTC. Dad had enjoyed the military life but didn’t like being an enlisted man. He wanted to be an officer, and college gave the chance to do that. He graduated with a degree in geography and as a Lieutenant in the Air Force. He wasn’t a pilot. He trained to be an intelligence officer. He didn’t think there would be another war as soon as Korea, and he didn’t think the pilots would have much to do during peace time. Well, Dad ended up in Korea, where he was an intelligence officer. He was attached to the 51st Fighter-Interceptor Wing of the 5th Air Force. He oversaw spy missions. 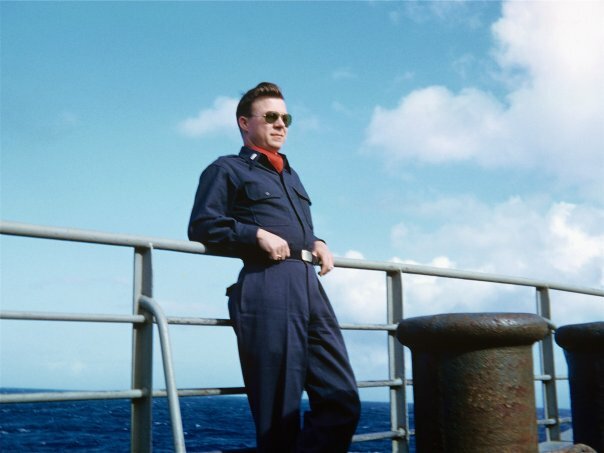 When the war ended, he came home aboard a morgue ship. It was the only ship heading out, and he took a ride along with 1500 dead soldiers. “It was a quiet voyage,” as he liked to say. Dad sailing home from Korea, the epitome of cool. I have that scarf. Dad returned to Evarts. He had met my mother just before leaving for Korea–she was a school teacher at Evarts High School. They married in 1957 and had three children. Me, my older brother Tom and younger brother Richard. Richard died in 1987 at 20 years old. Dad weathered that like he did everything else. Dad went on to serve 30 more years in the Reserves. Most of his service was as a Liaison Officer for the Air Force Academy. He recruited potential cadets for the Academy. He loved every minute of it. We also got to visit the Air Force Academy quite a few times. Dad had a variety of jobs, including Health Department Inspector and field agent for the old Kentucky Water Pollution Control Commission. His greatest success was as one of the first environmental consultants for coal companies. Nothing, however, topped his military experiences. With all his military service, one would think Dad was a super-patriot. Not really. He was always proud of the military and his own service, but he had a very cynical view of wars and those who start them. He did not believe that there were war “heroes.” He told me that there were two types of “heroes”: One was a person caught in a dangerous situation who just did what he was trained to do. The other was a crazy man who just didn’t care. Dad’s view never wavered. Soldiers do what they are trained to do. Period. Soldiers aren’t driven by patriotism. That might be why they are in the military, but it’s not what drives them. Discipline and training are their motivators. You are trained to follow orders, and that’s what you do. No one wants to die for their country. They’ll do it, but not because they want to do it. Everyone he knew wanted someone else to die for their country. He met a lot of injured in the hospital. He said not a one of them thought it was worth it. World War II was a miserable experience for almost everyone involved. Nothing–nothing–got his back up more than politicians talking about soldiers “defending freedom.” Dad’s view was that wars may be about freedom–but maybe not. They’re about whatever a politician decides is worth it. Never, never underestimate the importance of the GI Bill. Without it, he never goes to college, and we all end up suffering as a result. You’d be wrong to think my Dad didn’t love his country or the military. He did, warts and all, but he taught me to never overlook the warts. He drew me maps of Korea and showed me where they flew spy missions. He told me detailed stories right down to the names of those involved and even dates. His stroke had scrambled up his recent memory. He could remember most things, but he got the timing of things out of order. His military career, though, stayed sharp. Without intending to do so, Dad learned to compensate for his memory problems. He kept notes. He had a billing paying system that required him to keep every bill and envelope, but it worked. He kept track of his medication on a legal pad that he kept with him at all times. I also found out some less serious things. When he was at Great Lakes, he used to like to visit the “Old Sailor’s Home.” He said: “I would sit and listen to the old salts tell their tales of the days of wooden ships and iron men.” Wooden ships and iron men. That had always been a favorite expression of Dad’s. I never knew that he heard it at the Old Sailor’s Home. He told me many times that, if he couldn’t take care of himself, to just send him to the Old Sailor’s Home. Of course, he didn’t really mean that. The one time my brother and I talked to him about “assisted” living, he responded with “I will die in this house!” (Which he almost did, by the way). That was the end of that. What Dad enjoyed most was being Colonel Earl, as a lot of folks in Harlan County called him. He would have been General Earl, but he wouldn’t attend War College because he didn’t want to be away from us to do it. He loved attending events where he could wear his uniform. When I was a kid, we would visit the Air Force Academy in the summer. I would love those times when someone would salute him. Very cool. Lest you think he was a hard-core military father, he wasn’t. He wasn’t The Great Santini. He was a kind, doting father who probably should have been much tougher on me than he was. He had expectations of us, but no one ever praised our accomplishments more. He could make any trivial success seem like the greatest thing in the world. One of his favorite expressions was to say that one had a place at “the roundtable.” This meant you had arrived. He was always telling me that I was at the roundtable, even when I didn’t feel like I was even in the room. In 2005, my brother convinced Dad to visit San Francisco, where my nephew lived. I’ll admit that I was not in favor of this. I could imagine Dad getting lost in an airport or just being generally difficult taken out of his element. This is a guy who couldn’t stand to spend a single night away from his home. As usual, I was dead wrong. 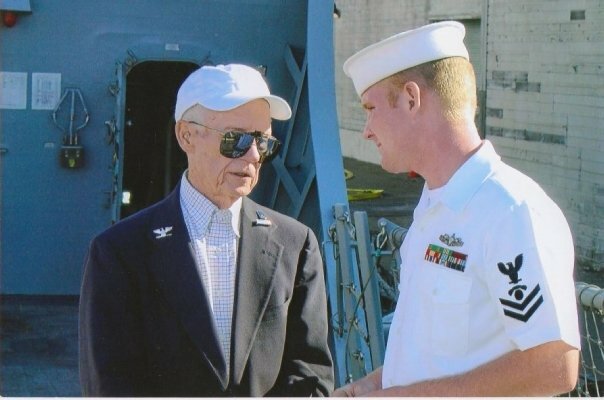 Dad toured the USS Hopper that week during Fleet Week. Because he was a retired officer, the ship’s bell rang when he boarded and he was treated like a celebrity. He absolutely loved every second of it. He also had dinner at the Top of the Mark restaurant where he ate in 1953 when he returned home. Few people knew how bad Dad’s health was the last few years of his life. We would visit his cardiologist, and the doctor would be amazed that Dad could walk up steps or even breath unaided. The day before he died, Dad and I talked. He was in bad, bad shape and lucid for only brief periods. He said: “I think I might have a death rattle going on now. I’m not scared. I’ve lived a life mortal men only dream about. Don’t you go moping around about your poor old daddy. This is how this is supposed to go.” He died the next day. I spoke to him on the phone only minutes before he died. The last thing he said: “I feel fine.” You know what? I think he did. Dad’s last big military honor was his funeral in May of 2008. The Air Force Honor Guard from Wright Patterson Air Force Base served as pallbearers. A bagpipe played Amazing Grace. The Harlan County Honor Guard was there, too. One of the men presented me with a Bible. He leaned over and whispered: “Your daddy was a good buddy to all of us.” At the end, a bugler–unseen, mind you–played Taps just as three jets flew over Resthaven Cemetery. I thought about that little fella from Evarts playing Taps at Great Lakes. Mostly what I thought was that Dad would have LOVED it.